She had a beer. So what. 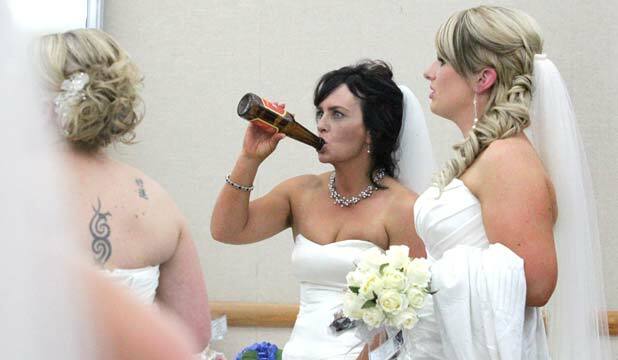 Taranaki’s beer-drinking bride Katrina Hayman is bemused by controversy that has erupted after a photo of her drinking a beer at the Taranaki Bride of the Year competition was published in the Taranaki Daily News yesterday. Organisers have called for an apology, many callers have expressed their displeasure and online commentators have slammed the photo as “disgusting”. But the woman at the centre of the “outrage” can’t understand what the fuss is about. “I mean that is just the type of person I am. I don’t like to portray myself as someone I am not. A lot of females drink beer and it’s just I felt more comfortable having a beer than having a wine,” Hayman said.